As my fascination with graphic novels and comics continues to grow, I find myself increasingly drawn to the inspirations of modern cartoonists, especially classic cartoons. Herge's Tintin series is a constant presence in the compilations and commentary on cartooning, and after reading a couple of the books, I can see why this simple comic is as timeless as it is fascinating. Earlier this year I read Tom McCarthy's Tintin and the Secret of Literature, where the Tintin books are evaluated for their literary merit. Michael Farr takes a different tack with Tintin & Co., profiling the dozen characters from the Tintin books he finds most interesting. The book is lavishly illustrated with panels from the series, and Farr breathes life into the birth of these characters as well as explaining the reasons they are important. 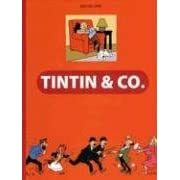 If nothing else, this book points out the depth of the Tintin comics and the true talent that was Herge. My next book is Mystery Train, by Griel Marcus.